I don't share a lot of our personal comings and goings on my blog, but every now and then I just can't resist, especially after our trip this past weekend to the pumpkin patch. I don't know about you, but after I've been following a blog for some time I start to feel like I actually know the writer and I enjoy looking at little snapshots of their lives. Do you feel the same? 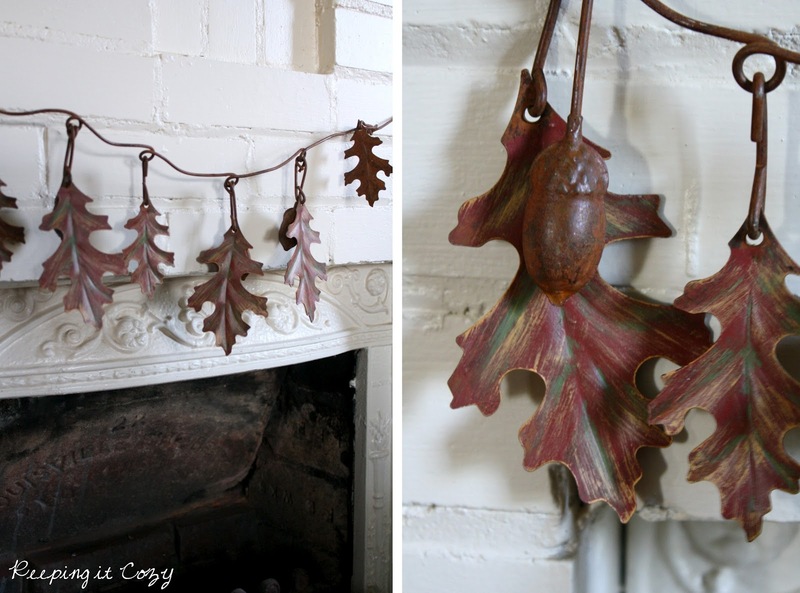 And while I love decorating for fall, that is by no means my favorite thing about the season. The days are so beautiful... I always forget until September arrives again... my household chores take a backseat because it's too nice to spend every minute indoors! We (especially Jillian and I) have been anticipating the pumpkin patch trip for a while now. I really can't tell you how many times I've read the fall themed Berenstain Bears' books to Jillian the past month! When we got off the wagon to venture out into the fields to pick our pumpkins, Jillian had picked up this beauty before we even knew it... I couldn't help but laugh when I turned around to give her picking instructions and found her holding the pumpkin up! "I found one, Mommy!" We had a wonderful weekend... the weather was beautiful and we visited the pumpkin patch one afternoon. We came home with pumpkins and corn and since I just finished painting the mantel, it seemed the perfect time to decorate. One of my favorite things about fall is taking a hay ride out to the patch and picking pumpkins to bring home. I may actually share some pictures later this week of our day. I especially loved these little white pumpkins and knew they would be perfect for the mantel. On our way to the pumpkin patch, we drove by some cotton fields and my husband kindly stopped after I begged, pleaded, mentioned I'd like to pick some. I may remove the cotton balls here soon but right now I'm just enjoying the branches. This past week I found a cute little wooden box and when I brought it home I realized the grain sack sachets that I bought from Ann fit just perfectly in it. I stuck them on the mantel until I figured out where to put them but then ended up loving the way they looked there. Of course, these sachets are my favorite thing right now so I think I would like them anywhere! We also saw these corn cobs at the pumpkin patch and the colors were so beautiful I bought a few. This year I'm really enjoying trying to incorporate natural elements of the season into my decor. I wish I could pan and show you a finished ceiling as well, but we're still working on it. However, I have been painting as I have time. The fireplace probably doesn't look much different from before in the photos, but I painted over the creamy off white with a very light gray. My original plan was white to match the trim I'm in the process of painting, but it looked much too stark against the wood walls and completely clashed with the picture above the mantel. Then I decided to try painting it the same gray I'm using on the staircase and it was just right. I love fall in the air and all the inspiration I've been seeing lately. I struggle with putting together vignettes, but nevertheless I've had so much fun taking a little time to bring in some touches of the season. How did you spend the first weekend of autumn? The playroom was our last stop upstairs... it only received a couple updates but I thought I'd go ahead and share a few photos. Believe it or not, this is one room I don't have a scary "before" picture to share! The walls in this room were already painted white when we moved in, but the floors were in a sad state, like the rest of the upstairs. We continued the same paint color in here as the office/schoolroom for an easy, bright fix. I cannot believe how much a painted floor can transform a room! The playroom is one of two bedrooms located upstairs. The girls spend so much time here and it's always the first place the kids run whenever we have company. I love that the majority of the mess stays out of view since it's tucked away... however, we do still have a toy box downstairs and I assure you by the time evening comes it looks like a small tornado has gone through the entire house (smile). We also have an extra twin bed in this room. If we have guests that need more than one room, I'll move Jillian into this twin bed so they can use her bedroom too. This is the other small update in this room... our neighbor recently asked if we would like this 1930's iron hospital bed frame. Umm, that would be a yes! My husband had to do some minor welding on it to accommodate the larger mattress, so I was pretty excited to finally put it together this week. Someday I'd like to change out the bedding and perhaps paint the bed frame, but for now this works. With all the work we've done around our house, I have not spent too much time decorating in here. For the most part the walls are bare, but we do have some ideas for shelving sometime... you know, in our spare time (ha)! It is not unusual for me to leave a wall bare though until I find exactly the right thing. Still, the bright colorful toys and painted floor make it such a cheerful place to be. The door leading into the playroom is the original. We wish many times the previous owners had left the original doors downstairs as well, but I'm glad we still have a couple with us. To be honest, this room is often cluttered and simply a mess, but it's a sweet mess filled with precious girls. I wouldn't change it for the world! Hope you have a great weekend. We have plans to go to the pumpkin patch on Saturday and let's just say I'm as excited as Jillian! Have I mentioned that I just love autumn? The warm colors seem to fit in so well with our old house, so it seems to be an especially enjoyable time to do some decorating. I had a great time taking a break yesterday and creating a fall table. It all started while the girls were napping and I decided to use some apples a friend had given us and bake a rustic apple pie for dessert. The apples were such a beautiful rich red that they inspired me to clean off our dining room table and put together a fall centerpiece. I thought it would be fun to see if I could put something together using only things we had on hand and elements from nature. I immediately thought of an old plank of wood we had sitting on our back deck. It was a piece we had to remove from our eaves when we built in the bookcase upstairs recently. I knew there was a reason I convinced my husband to set it aside instead of burning it! We didn't have any fresh flowers or even any fall foliage, but then I thought of some corn cobs and husks I had seen on the side of the road just down the street. Just recently the combine had gone through and there were some pieces tossed outside of the fence. I'm sure the cars that saw me gathering these as they drove by thought I was crazy! I set some apples along the plank and scattered some acorns we had just gathered recently. 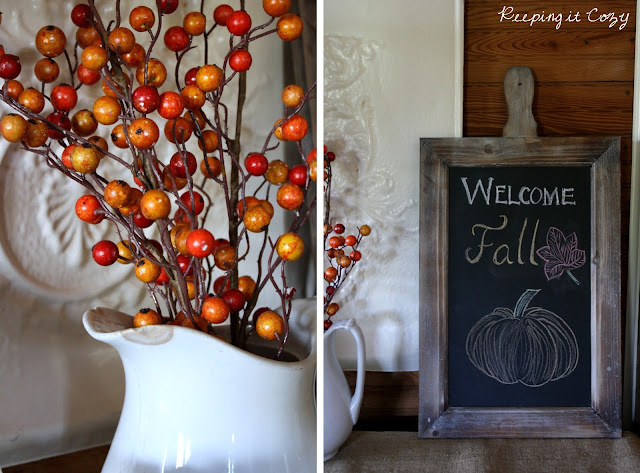 My goal was a rustic autumn table fitting for our farmhouse. I selected some mismatched dishes from the china cabinet that had those warm, rich colors of fall. The silverware was wrapped with some burlap (which obviously is not a good use for a napkin - smile) and some felt silverware rings my mom had made for me a couple years ago when Thanksgiving was hosted at our house. I wrapped some corn cobs with twine and let them hang on the sides of the table for a little something extra. I have to say that I really loved the way the table came together and I almost hated to put it all away. (smile) However, I loved the wood plank so much and the corn cobs on the table that they will remain for the season. Disclaimer: While most of my blog posts originate from a real life event, this table setting was created purely for enjoyment. It's times like this I'm glad I have the excuse of a blog post to use as a creative outlet! Fall is absolutely my favorite season to decorate for. Always has been... I love the colors and the warmth it adds in a home. I've been longing to get out some of our fall decorations for a few weeks now. Unfortunately, our living room is still in a state of disarray right now with our ceiling renovation, but I still couldn't resist adding a few touches around the house. 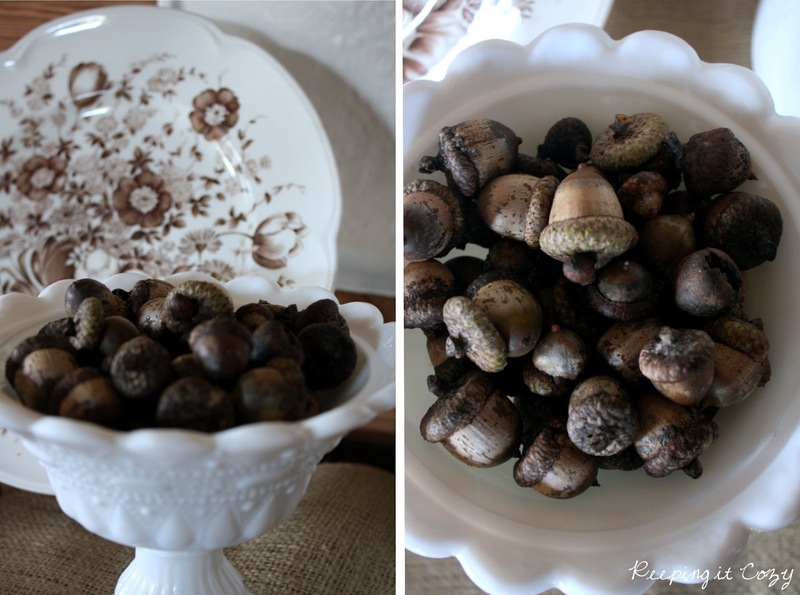 Remember the acorns we gathered recently on our walk in the woods? I love trying to bring a little of nature inside as the seasons change. My most recent purchase for our house was a fun splurge... 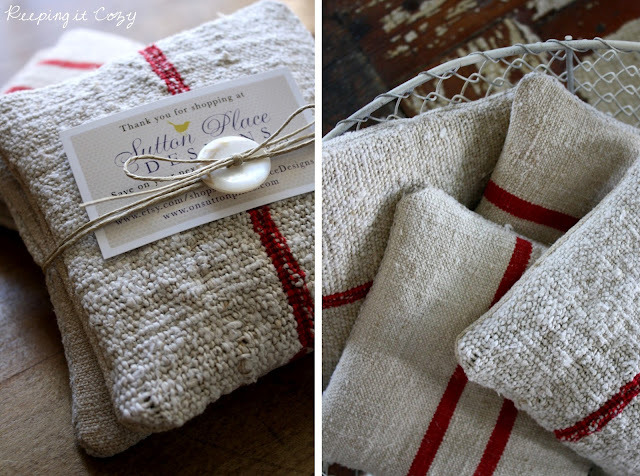 I've had these grain sack lavender sachets on my "want" list for weeks now and thought surely the season change was a good excuse to order them. These came from the lovely Ann of Sutton Place Designs. I ordered four sachets and the packaging was so pretty it took me a couple days to even remove it! I love how she varied the texture and patterns, plus they smell incredible. Right now I have them in a temporary basket on our living room coffee table, but I'm on the lookout for the perfect vintage basket or box for them. These sweet little plates are the first thing I bring out out every autumn. I have such fond memories of these... my mom and I bought them on a beautiful autumn day eight years ago after some fun at the botanical gardens. They were my first seasonal purchase for our first home. I can't wait until the leaves start turning outside... the foliage around here is so beautiful in a month or so. I know I'll be sharing plenty of pictures! And truthfully, there is a reason I'm only showing you close ups of my seasonal decorating. Like I mentioned earlier, our living room is a little out of order since we installed our new planked ceiling. I thought I'd give you a little preview... I think it will be so pretty. All it needs is a little paint (sigh... I think painting will always be a part of my daily life). I can't tell you how anxious I am to get our home organized and everything put back where it should be! I hope you've had a wonderful week and have some fun plans for the weekend! We are off to visit the fair this afternoon and maybe we'll make some progress on that ceiling this weekend. P.S. I hesitate to mention this again, but there is still time to vote for Keeping it Cozy in the Country Living Blogger Awards! You can vote every day until Monday (the 17th). Without a doubt, being a finalist is probably the most exciting thing that will ever happen to my little blog and I can still hardly believe it. I cannot even express how much your kind comments and support have meant to me. I've had a grateful heart for such wonderful friends and I treasure every comment! 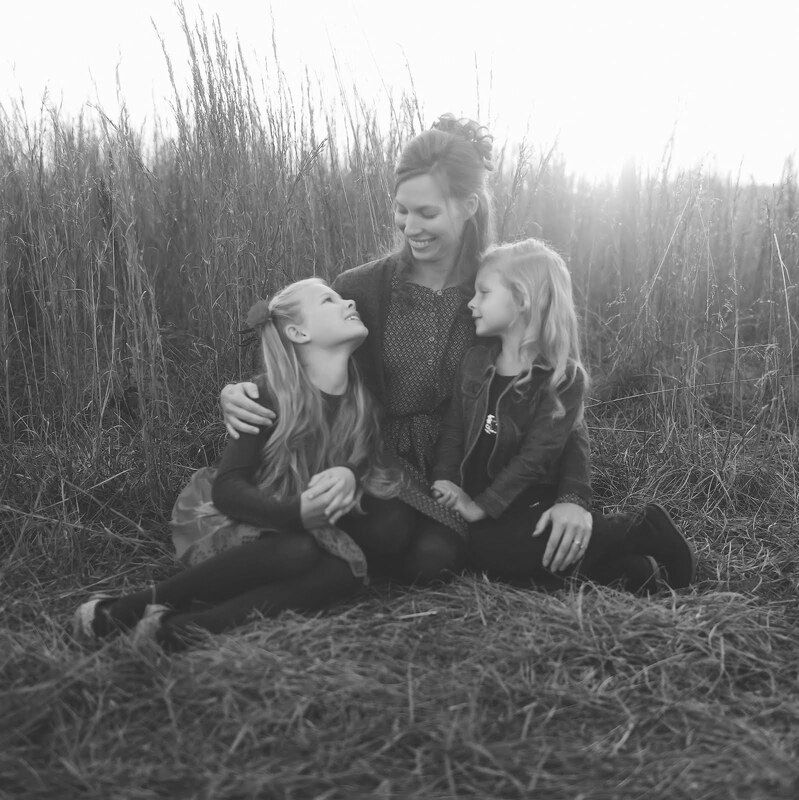 I never imagined the friendships that would come from blogging. Thank you! Here we are, almost at the end of summer... with some cooler weather this weekend, I could smell fall in the air. These days there isn't much left in the garden; some okra, bell peppers, and green beans is just about all that remains. Saturday I watched my husband pull out most of the tomato bushes and strange as it sounds, I felt... sad. I thought I would be happy to see those tomato plants go after all the canning I did, but instead I think I'm going to miss that crazy garden of ours. It became such a part of our everyday lives this summer and we had so much bounty to be thankful for... I hardly bought any produce over the summer and have enough tomatoes canned to last us most of the winter. Although it feels a little bittersweet saying goodbye to summer and its bounty, I'm looking forward to all that fall has to offer. Isn't that the joy of eating foods that are in season... each season brings something new and delicious to enjoy. Yesterday evening the house was quiet... one girl was asleep, the other with my mom and dad... I was doing dishes and all of a sudden I had this overwhelming urge to take a break from my routine the following day and go to my parents' farm and spend a little time with my mom and the girls outdoors. It's funny... my mom and I lived hundreds of miles away from each other for years. Now we live just down the road from each other but we're always busy, busy. Usually it's a quick catch up before we race off in separate directions to the next chore, the next task. Always too busy, that's what I am most of the time. I don't know if it's the same for you, but lately it feels like the days just keep getting busier and busier. I keep thinking the next week or the next month will slow down... but it doesn't. Lately we've been trying really hard to finish up some projects in our house so that we can just take a break and enjoy the season. The days are still hot and the foliage is still green but I think I started to see some hints of autumn today during a much needed walk in the woods at my parents' farm. We named this trail at the bottom of the hill the "nut trail" the first time we all walked it for the simple reason that there are nuts scattered across the ground. Today I was on the search for some acorns for the living room and we found plenty. Really, could there be a cuter nut? Sometimes it seems like we spend so much time working on our house and running here and running there. This fall I want to make time for some other things. Yes, I think a little balance is just what we need. My fall list doesn't consist of things like painting. Nope, I'm thinking about things like fall crafts with the girls, picking pumpkins, planting mums, playing in the leaves and especially walks on the nut trail. I'm sure I'll be adding to that list this weekend while I (ugh) finish some painting. But before I wish you a happy weekend, I had to introduce you to my parents' animals. This is Belle, the perfect farm dog. You know that she's always game for a walk. And meet Promise, the funniest horse I've ever met. She runs towards us when she hears the car coming up the hill and always wants to be nearby to join in on the fun. Happy weekend! And I'd love to know if you have the time... what are you looking forward to doing this fall?